Arrival at Muscat International Airport. After clearance at the immigration and the customs, please walk to the arrival hall. You will be warmly welcomed by our local Arabic or English speaking guide who will take you to the check in at the hotel (check in time after 2 pm.) Overnight at the hotel in Muscat. Breakfast at the hotel.Half day Muscat City Tour. After breakfast we will meet in the hotel lobby and proceed for a half day tour of Muscat. The tour includes a visit to the Grand Mosque where you can see the second largest carpet in the world. Later we visit the modern Muscat as well as parts of old Muscat, visit of Bait Zubair museum; a private museum with a rare historic collection. Stops at Al-Alam palace, 16th century built Mirani and Jalali forts and the famous MuttrahSouq. Return back to hotel by 2 PM. Optional: In the evening we can go outside to have dinner in a traditional restaurant. Overnight at the hotel in Muscat. Breakfast at the hotel. Then full day tour to Sur: We depart by 4WD to Sur via the scenic and rugged coastal route. 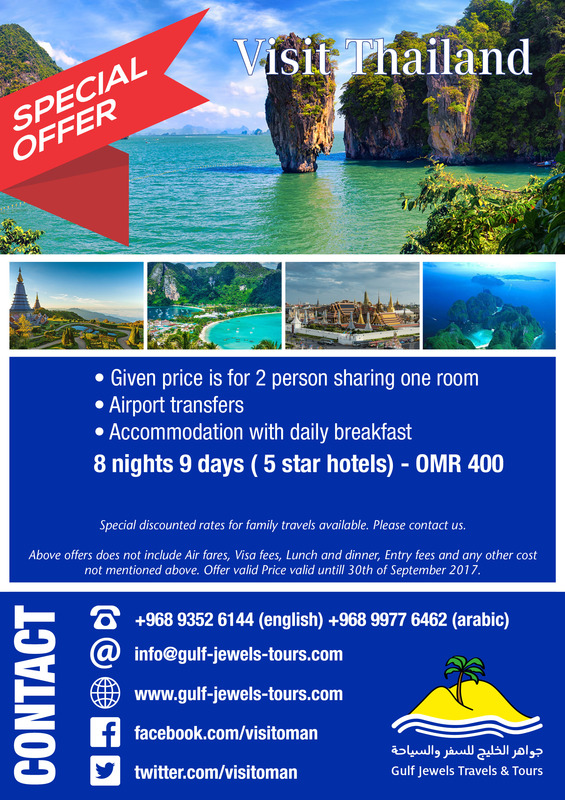 This route offers breathtaking glimpses of the blue waters of the Gulf of Oman offset by pristine white beaches. After we pass the fisherman village of Quriyat we will stop at the Bima Sinkhole, a spectacular limestone crater with blue green water at the bottom. The next stop is at Fins Beach, one of the most beautiful beaches in Oman. Then we drive ahead to WadiTiwi. The road to Tiwi winds between traditional houses. The sight is remarkable with its lush green palm tree plantations with water flowing all the year. In Sur we will check in to our hotel. 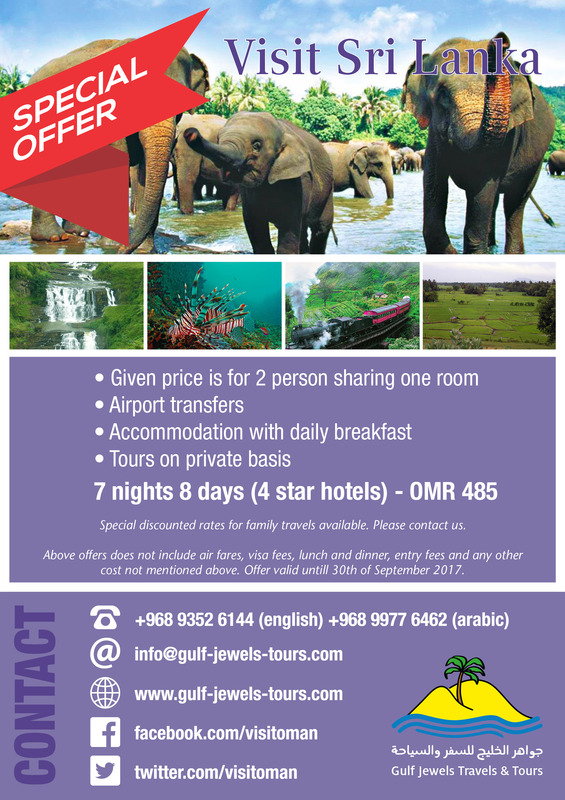 After dinner we will head towards to Ras Al Jinz, where we visit the famous Green turtle beach. At night we will return to the hotel in Sur (alternatively we can visit the turtle beach early in the morning). Overnight at the hotel in Sur. Breakfast at the hotel. After breakfast we start our tour to WadiBani Khalid – a beautiful oasis spot in the middle of the barren and dry mountains. Then we move to the Wahiba desert. A breathtaking tour through the sand dunes, where we also have the chance to visit Bedouin families and enjoy the sunset. Dinner and overnight stay at one of the traditional desert camps, where guests can also book optional activities like camel riding. Overnight at a camp site in the Desert. From Nizwa we move to Bahla (the city of potteries) to visit Jabreen castle, to have a look at Bahla Fort (the biggest fort in Oman, which is again another World Heritage Site). After that we proceed to Alhamra to visit Misfah which is famous for the unique way of growing and planting trees. Overnight at the hotel in Nizwa. Optional visit of the Al Hoota cave, a spectacular cave which is open for tourists. Overnight at the hotel in Nizwa. After breakfast we visit the lively Nizwa Souq (the local Market ) where you can find potteries, silver, gold, traditional weapons and animals. After the Souq we will visit Nizwa Fort, which is one of the most beautiful forts in Oman. From Nizwa we will drive a scenic road back to Muscat International airport and fly to Salalah . Overnight at the hotel in Salalah. After breakfast we will move to TaqahCity. Taqah is the second largest city of the Dhofar region and is located 30 km from Salalah. After visiting Taqah castle we will see one of the archaeological and natural sites in the region which is called KhorRori or Sumhuram. This site dates back to the first millennium BC. At Evening you will enjoy drinking the fresh coconuts and visiting Al HafaSouq where you can find the locally produced frankincense. Overnight at the hotel in Salalah. After breakfast we will visit Al Mugsail& Al Marneef Cave, where you can see the natural springs. Then we will move to Ayoub tomb, allegedly the tomb of the prophet Job. The tomb is 3 meters tall and 1 meter wide. Back to hotel. Overnight at the hotel in Salalah. We will proceed to visit one of the most beautiful natural springs in Salalah which is flowing around the year. It originates from the mountains and has pure water. After that we will visit one of the biggest sink holes in the world (Tawi Atair) and will later have a short stop at Wadi Darbat. Back to Hotel. Overnight at the hotel in Salalah. Today we will visit Al Baleed Ancient city. The rest of the day is for leisure. Overnight at the hotel in Salalah.